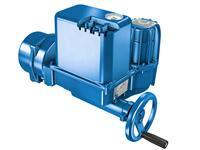 c-matic actuators have an integral control-unit with built-in user interface in sturdy industrial design. The contactless torque and position measurements result from the COMBI sensor. With the LEARN function an easy setting is guaranteed. The actuators made by DREHMO contain programmable functionalities.